Intel has announced some new products with which it aims to transform storage in the data centre. Its announcement concerned three product lines; the new 'Ruler' form factor SSDs, Dual Port SSDs, and SATA SSDs for data centres. 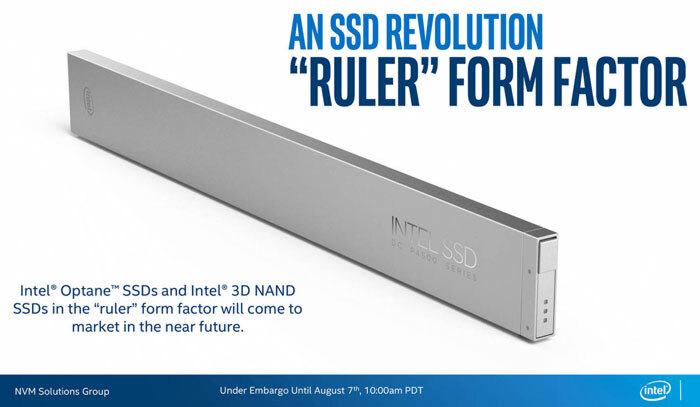 Probably the most interesting part of the announcement was the talk of the Ruler SSDs, which do indeed look like rulers but are a bit fatter, so are probably more akin to a spirit level. The Ruler form factor was designed to optimise data storage in servers. Its name derives from the long skinny shape and it "shifts storage from the legacy 2.5-inch and 3.5-inch form factors that follow traditional hard disk drives, and the add-in card form factor, which takes advantage of PCIe card slots, and delivers on the promise of non-volatile storage technologies to eliminate constraints on shape and size," says Intel. Using Ruler SSDs will make better use of the server storage capacity, and are further optimised for cooling and power consumption. These SSDs will use Intel's 3D NAND technology will enable up to 1PB in a 1U server. Intel describes that capacity as being enough for 300,000 HD movies, or 70 years of non-stop entertainment. Intel plans to release both 3D NAND SSDs and Optane SSDs in the Ruler form factor "in the near future". 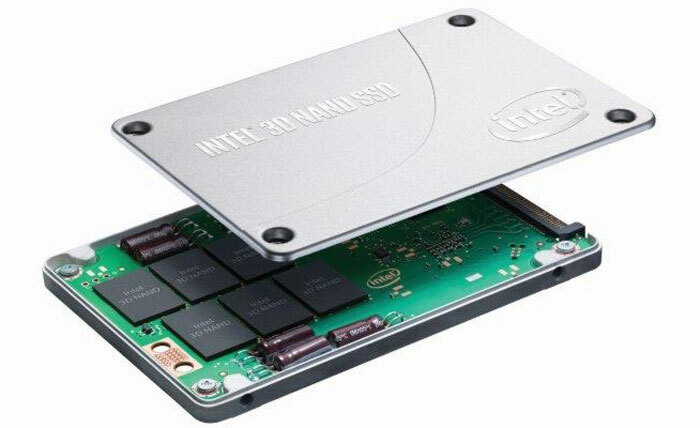 Dual Port Intel Optane SSDs and Intel 3D NAND SSDs are designed to replace SAS SSDs and HDDs and, with new storage technologies, deliver more IOPS, more bandwidth and lower latency than SAS SSDs. Dual port Intel SSD DC D4500, D4502 and D4600 Series are due for release in Q3 this year. Finally Intel is introducing the SSD DC S4500 and S4600 Series for data centres. These combine "a new Intel-developed SATA controller, innovative SATA firmware and the industry’s highest density 32-layer 3D NAND". Intel reckons these will be attractive products to those intending to preserve legacy infrastructure. Pictured above, the Intel SSD DC S4600 and DC S4500 Series are said to be available immediately. Looks good. How much $$$ for 1PB SSD? Were quite a way off that, they mean you can put enough of these in a 1U box to total 1PB of storage.